Last April Kevin Ditzler and I flew into the Hawkins Glacier looking for something. We weren't really sure what we were after but after a few days we decided on the 8,500 foot south west face on University Peak. We spent a night near the base of the face and headed up the next day. 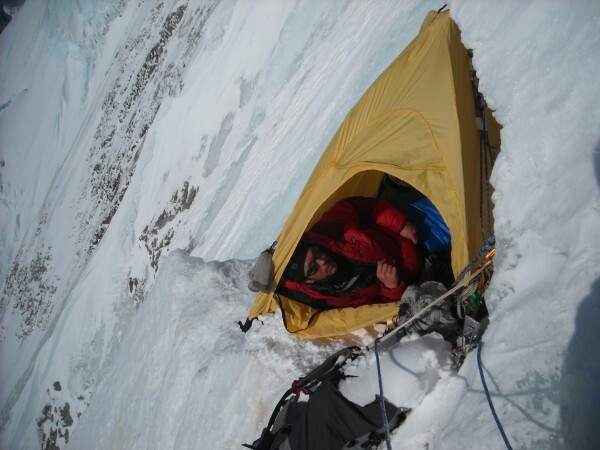 We climbed for about 36 hours straight thinking we'd find some kind of a ledge to put the tent on but never did. It took hours to chop out the first ledge. Our lack of sleep didn't speed it up any. Finally with the tent up we got some sleep. The next few days kinda blended together. Endless grade 3 ice with the occasional grade 4 step. We topped out on the ridge crest in the middle of the night on the fourth day. It took two more days to go from the ridge creast over the summit and down the North Ridge. We pitched the tent in Beaver Basin at the base of the North Ridge and waited for the air plane. We had no idea how long we would be waiting. Nobody knew where we were. Before we left the Hawkins we left a note in the tent for Paul Claus. All we could do was hope he found our note. After four long days of very minimal water and no food Paul showed up and flew us out. johnkelley is a climber from Anchorage Alaska. This is the real deal. Fantastic. Paul's a character, eh? He flew us into Bona in '91. Wow, wild climb. That peak looks uber gnarly (dude). That peak looks a lot like K2. Wow, classic looking peak and great adventure. VERY NICE! Please post more alpine routes if you can! After four long days of very minimal water and no food Paul showed up and flew us out. Now that DOES sound inconvenient. YIKES. Here's a few more of the endless ice, calf burning hell and one of Beaver Basin. University peak is the real deal! Largely unknown, but one of the most serious peaks in Alaska. How many times have people stood on the top of that thing? I know that it has been skied. Maybe one of the craziest ski descents of this era! It's got two other routes on it. The North Ridge and the Third Semester on the East face. The ski descent line, the south face, wasn't from the summit. I think they stopped near the top of the south face and skied from there. It's about a 7,000 foot ski run. Great TR. Now if only the Sierra Nevada's University Peak had a route like that! Thanks so much for such a fine post. Way to go on the understatement! Great looking climbing on glistening water ice. 8500 feet of that would burn your calves, even with a night of "sleep" on that little carved-out ledge. Where in AK is that? I just spent four days in the Valley climbing with two strong Alaskan women guides, and after all their stories I'd like to hear more. Doug, its in the U.S. side of the St. Elias range, just south of Mount Bona. East of McCarthy. Would you be able to draw your line on the photo of the face you climbed please? Just for interest. Looks like a cool route to try some day. Totally Awesome, Quite an incredible FA, Way to go and thanks for sharing!!!! BAM! Now thats a Trip Report. Way to bust out the gnar and keep it all cool hand luke with the casual write-up. A real inspiration. One of the better lines done in Alaska period. Bigtime Grats. April gets those longer high pressure systems but still that many days on the face would have me rubbing my lucky weather rabbits foot for sure. Way way solid new FA. Dude you are tearing it up. 100+ years of serious alpinism and Alaska has not even begun to be scratched for it's possibilities. Any chance to get some picture links refreshed? He just got picked up by chopper a couple hours ago. No news other than that right now. Gotta say I was shocked to have a helicopter land beside my tent this morning while I was making coffee... I’m not really sure who decided I was overdue? My permit is good for another two and a half weeks. Back in KTM now for some reason? Hey John- Do us all a favor and consider reposting all of your photos from this outing in the OP if you would be so kind. This is such an inspiring thread! Way to get after it man. In the end Polartec were the only one’s who had the guts to admit any wrong doing on their part. The only ones to offer any apology. Very sorry to hear that John and those involved should be ashamed of themselves. They should have contacted you for permission as that is the most minimal effort that is at all acceptable. Here’s one Kevin took of the 1st bivi. It’s the only one I have access to at the moment.